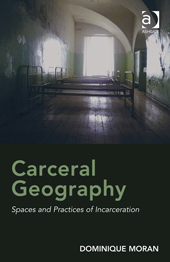 My new book ‘Carceral Geography: Spaces and Practices of Incarceration’ is now out with Ashgate. The ‘punitive turn’ has brought about new ways of thinking about geography and the state, and has highlighted spaces of incarceration as a new terrain for exploration by geographers. In this book I try to offer a geographical perspective on incarceration, track the ideas, practices and engagements that have shaped the development of this new and vibrant subdiscipline, and scope out future research directions. By conveying a sense of the debates, directions, and threads within the field of carceral geography, the book traces the inner workings of this dynamic field, its synergies with criminology and prison sociology, and its likely future trajectories. Synthesizing existing work in carceral geography, and exploring the future directions it might take, it develops a notion of the ‘carceral’ as spatial, emplaced, mobile, embodied and affective. Contents: Introduction; Origins and dialogues. Part I Carceral Space: Carceral space; The emotional and embodied geographies of prison life; Carceral TimeSpace. Part II Geographies of Carceral Systems: Geographies of carceral systems; Prison transport and disciplined mobility; Inside/outside and the contested prison boundary. Part III The Carceral and a Punitive State: The carceral and a punitive state; Prison buildings and the design of carceral space; Carceral cultural landscapes, post-prisons and the spectacle of punishment; Afterword; Bibliography; Index.